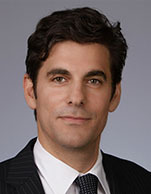 Gregory Lewis, CFA, is the Global Head of Maritime Research in Credit Suisse Group's Equity Research. Prior to joining Credit Suisse Group, he was an Analyst at Fortis Bank covering the shipping and oil service industries. He also worked as an Engineer for a U.S. Naval contractor and for an engineering consulting firm. He holds a B.S. in ocean engineering from the University of Rhode Island and is a Chartered Financial Analyst.